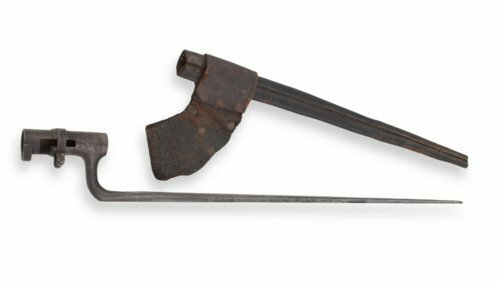 This steel bayonet for a U.S. rifle-musket model 1855-1870 with 25/32" socket bore and L-pattern mortise was manufactured by Collins & Company of Collinsville, Connecticut. The donor's father, Elisha William Viers, who was mustered in as a Corporal with the 38th Ohio Infantry, may have used it during the Civil War. The 38th's record includes service in Kentucky, Tennessee, Mississippi, and finally Sherman's March to the Sea. Viers moved his family to Jewell County, Kansas, ca. 1890.